Take an early morning start to experience an unforgettable tour to climb up to the second highest point in Bali, the sacred Mount Batur. 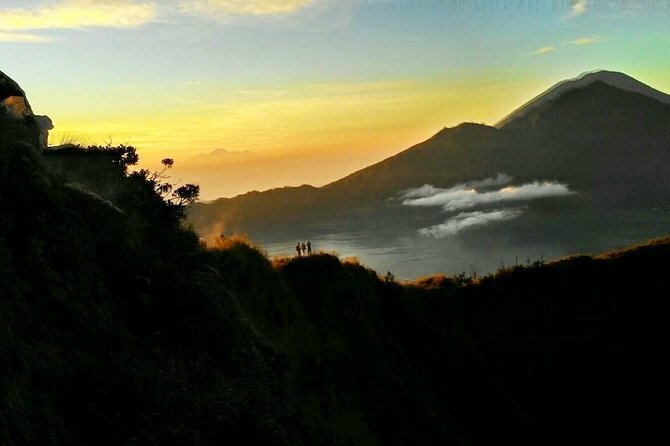 Your full-day private tour will have you doing a 2-hour hike to the top of Mount Batur in time for a basic breakfast while watching the sunrise. Your breakfast will include tea and eggs cooked in the natural volcanic steam at the top of the mountain. At the end of your trek, you will be able to soak in the natural hot springs nearby. The perfect way to finish your tour. Mount Batur is one of Bali’s most sacred mountains according to the Hindu people. It is still an active volcano located 1717 meters above sea level and is known for its natural beauty and magnificent sunrise. This mountain will show you an unforgettable experience that will leave you with lasting memories of Bali. At the early time of 1:30am – 2am you will be picked up from your hotel and will be taken to the starting point of your trek, the foot of Mount Batur. You will arrive at around 3am – 3:30am. Upon arrival you will receive an introduction and safety procedure briefing by your english speaking experienced guide before beginning your trek at 3:30am – 3:45am. On the way back you will visit the natural hot springs at 10am where you can relax in the warm and natural refreshing water for a couple of hours. On the way back to your hotel you can also stop at a traditional coffee plantation to see the manual process of coffee production and witness the production of a strange form of coffee from the animal pup called Luwak Coffee. You will arrive back at your accommodation at around 12:30pm. My husband and I did this tour on our honeymoon and absolutely loved it. As other reviews have stated, we simply can't stress enough that this is a fairly difficult hike. If you have weak knees or ankles, this is not the tour for you. That said, though, if you're up for a challenge, this is absolutely worth it. There were about 200 people of varying fitness levels who hiked up the trails along with us. The top of the volcano was very chilly, so bring a dry jacket so that you can fully enjoy the views and the breakfast. Be sure to also bring a swim suit for the hot springs, too. It's a very nice outdoor spa-like atmosphere. (Towels are provided.) Out of the whole experience, the walk down the volcano, that goes by a beautiful temple and through a farming community was our favorite. It was beautiful scenery and fascinating to learn more about the community. Overall, a wonderful day! The guides were fantastic, including Komang Godoh, who was our driver on another private tour the day before (Best of Ubud with the Bali Swing), too - so fun! My fiance proposed to me during the sunrise so I will always be biased in this review. But I couldn't reccomend doing this trip any more during your stay in Bali. our driver from Ubud - Komang Godoh was brilliant and our private guide was amazing and took his time with us up the mountain and stopped whenever we wanted to stop. I would reccomend having a private tour guide as there were loads of people travelling up so we went ahead of everyone else missing the traffic of people up the mountain. 100 reccomend!! After initial booking I contacted them regarding contact details of the driver clarification on pick up and times and response was 2 hours which is great. We were picked up by our driver Gusti Rasnayasa promptly at 0130 who had just the right amount of energy for the two of us being sleep deprived to not feel horrible. We had a good nap on the drive to Mt. Batur with a quick pit stop as Gusti organised breakfast which we ate at the top/stop of Mt. Batur. We met up with our guide Asmara Putra who was a bit quiet but very polite and friendly. Seeing as we were two young guys he initially set a decent pace but when he realized I wasn't particularly fit he slowed the pace enough that the hike was challenging but not too slow that we didn't get a good spot we got a great spot. We took frequent short breaks throughout the hike and eventually we made it up there in time to get a small little table for our breakfast eggs, bread, banana and got some coffee. Definitely pack a jacket or long sleeve shirt as it does get chilly at the top. After meeting back up with our driver Gusti we headed to the hot springs for a soak and unwind which was beautiful and not very crowded either. Since we were more awake we had much more of a conversation with Gusti who talked to us about the landscapes and some local culture on the way towards the Luwak Coffee plantation where we had a great tasting of 12 or 14 teas/coffees as well as some luwak coffee which we bought some of : . We had a wonderful time on this trip. Our driver for the day Mr. Godoh with Hire Bali Driver was excellent and provided 5 star service. He gave us as much time as we needed at each stop and was very knowledgeable. Definitely would recommend. Friendly driver and guide, Unfortunately my partner was sick and struggling, the guide was very helpful and accomodating towards her. About 1.5km in she was about to give up and turn around, with a few stops and me hassling she got halfway 2.5km to a rest stop with a view over the water and across from Mount Agung. She stayed here and I continued on for about another kilometre before deciding to turn around and make sure she was safe. We will both do it again next time and get to the top. Take plenty of water and money as some locals use scooters to ride up and sell you anything they can. Hot springs were a godsend with nice views them selves and the coffee plantation was amazing too TAKE MONEY it's hard not to walk out with plenty to take home. I would highly recommend this tour to anyone considering a volcano hike. We managed to get 2hrs of sleep on the drive from Semiyak to Mt Batur, so it wasn't a completely sleepless night. Torches, water and a small breakfast were provided. Definitely bring a warm jacket for the peak and 30,000 IDR for a warm tea. Our runners got very dusty so consider bringing an old pair. The hot springs afterwards were perfect for refreshing after the hike, and the coffee/tea tasting helped us wake up again! This definitely made the entire volcano trek experience a lot more enjoyable. Amazing tour. Somewhat difficult hike in that the rocks are loose and it's about a 2 hour hike up hill. Views are beautiful from the top, guide was fabulous, and driver was great too. Hot springs was a little gross, but I'm a germaphobe. Coffee and tea tasting was awesome, purchased several teas.